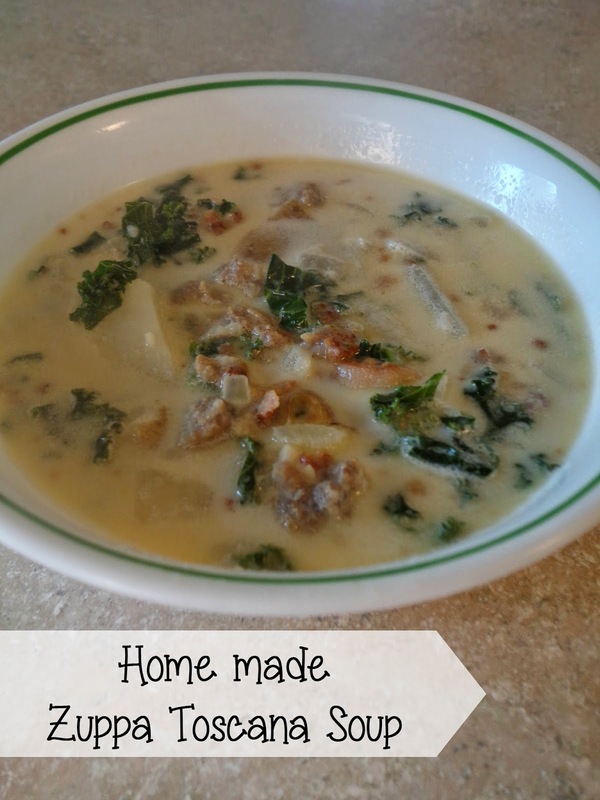 One of my most favorite dishes ever is the Zuppa Toscana Soup at Olive Garden. A while back I found this copy cat recipe on Pinterest and I’ve been sitting on it since, longing to make it but afraid that it wouldn’t taste near as good. I finally purchased the ingredients over the weekend and made it. And I can say, it’s just as good at the Olive Garden, if not better. It’s really delicious! 1. Brown sausage in a pan over medium, breaking up into small pieces as it cooks. 2. Drain sausage and set to the side. 3. Brown bacon in a pan over medium heat. 4. Drain bacon and set to the side. 5. Place broth, water, garlic, potatoes, and onion in a pot. 6. Simmer over medium heat until potatoes are tender. 7. Add sausage and bacon to the soup. 8. Simmer for 10 minutes. 9. Add kale and cream to pot. It was so easy to throw together- and tasted amazing. You can’t wait another moment- Go make this! « Summer is 4 months old!